In the world of Doctor Who the friends The Doctor travels with are just as important to the story as the good Doctor himself, they are our window into the fantastical world he inhabits. When a companion decides to leave the Doctor’s company its a sometimes a sombre occasion, or sometimes a cause for bittersweet happiness as someone take their chance to spread their wings away from The Doctor and every so often the manner in which the companion leaves is just downright strange. 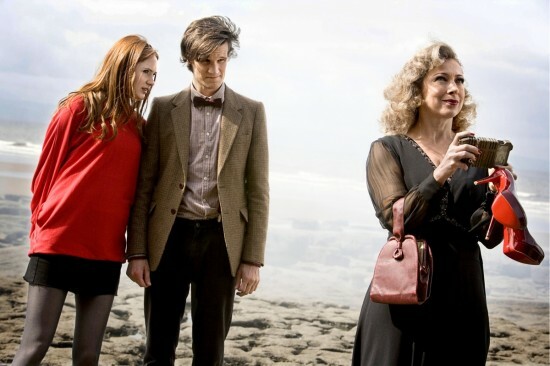 In this post I’ll explore the ten strangest ways in which some of our faithful friends have moved on from the Who-niverse. As always I wont be shying away from SPOILERS for this post so please read with caution, also I’ve picked this list based purely off what we see of the Doctor’s televised adventures, not any of the books or audio plays. Liz Shaw is a strange case all around, although generally regarded as a companion of The Doctor by fans she never gets to travel in the TARDIS as The Doctor is confined to the Earth by the Time Lords, she is there as she’s on attachment to UNIT and ends up being The Doctor’s assistant by default as shes the only one who can keep up with him, having several degrees across several disciplines. Her odd status very contributes to her equally odd exit, she never gets one. 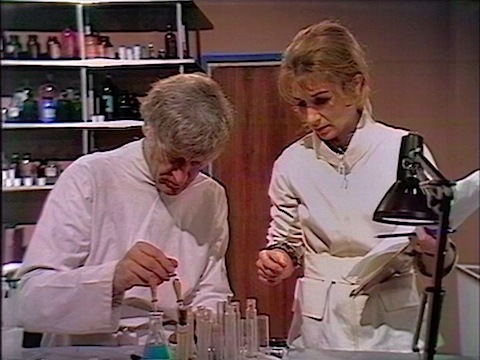 Sometime in between the end of series seven’s “Inferno” and the beginning of series eight shown in the events of “Terror of the Autons” she just disappears, sending a message via The Brigadier that shes gone back to Cambridge to continue her own studies, stating that all the Doctor needed was “someone to pass him his test tubes and tell him how brilliant he was.” Considering that Liz is replaced by Jo Grant, perhaps the archetypal ‘ask-stupid-questions-and-get-kidnapped-a lot’ companion I don’t think she was too far off the mark. Leela, daughter of Sole, warrior of The Sevateem, blasphemer, stowaway and ultra violent Eliza Doolittle, what fate would befit her? Glorious death defending her people? Leaving the Doctor to lead the Sevateem or perhaps another tribe in need of the knowledge she could bring? Nope, she declares that shes in love with someone she has virtually no screen time with. In “The Invasion of Time” while Leela traipses around the hinterlands of Gallifrey trying to jolly together support for The Doctors throughly bonkers plan, The Doctor is lumbered with dragging around Andred, the nice-but-dim Commander of the Chancellory Guard. After The Doctor’s plan somehow comes together and its time to be off on the next adventure, Leela declares that shes staying on Gallifrey because shes in love with a just as surprised as we are Andred, to which The Doctor just shrugs his shoulders and leaves. While the “falling in love with a random person from the story” exit strategy is by no means unusual for companions, Leela’s is so out of character its embarrassing and its someone she has no time alone with, she might as well as shacked up with Castellan Kelner! Also for those of us who care about such things it directly contradicts previous canon that stated the aliens are not allowed on Gallifrey, which after all why Sarah Jane Smith has to leave The Doctor! Everyones favourite stroppy mouth on legs Tegan always seemed like a somewhat reluctant TARDIS traveller, she spends most of her time aboard wanting to leave and having passive-aggressive arguments with some of her fellow travellers, Tegan’s final departure from the TARDIS comes after months of painful events, the death of Adric, her possession by The Mara, Nyssa’s decision to leave and the bloody beginning of the Dalek civil war all prove too much. Tegan seemingly decides on the spot at the end of “Resurrection of the Daleks” to leave The Doctor’s company, says a extremely perfunctory and accusatory goodbye to The Doctor and Turlough and runs out of the warehouse, but then almost immediately seems to change her mind, only to see that the TARDIS has already left. 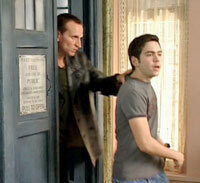 I think this departure is odd as it seems to come out of nowhere and Tegan leaves the Doctor on a fairly bitter note, a pretty unusual choice. After her adventures searching for the Key to Time with The Doctor everything seems fine and dandy with our resident Time Lady, as the fourth doctor chats to her from the console room Romana enters, looking completely different she apparently decides to regenerate just for the hell of it, eventually settling on a form resembling Princess Astra. This is an odd exit for me as not only do we not get a chance to say a proper goodbye to a character but there seems to be no rhyme or reason to the regeneration at all. Peri’s adventures with the Doctor were always a bit… troubled to say the least, poor old Peri could make lists like this several times over, its not many companions who are nearly throttled to death by the Doctor, however its when we get to her final appearance in “Mindwarp” part of the infamous “Trial of a Timelord” series that things get really weird. 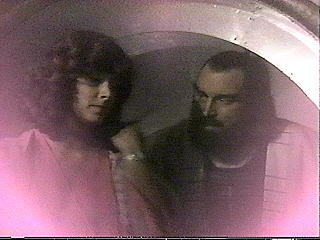 At the end of the episode Peri is killed when Lord Kiv replaces her brain with his and Kiv-in-Peri’s-body is killed by Yrcanos (as played by a typically bombastic Brian Blessed). Just as you’re getting over this out of the blue death of another companion, it is revealed to the Doctor, in a pretty “oh by the way” style by The Inquisitor, that Peri was rescued from the time stream at the last second and allowed to live out her days as a warrior queen alongside Yrcanos. As if that wasn’t demented enough the episode “The Ultimate Foe” chooses to portray this by showing Peri and Yrcanos in the only scene they’re in together in “Mindwarp” inside a pink loveheart (see picture above), and the Doctor never bothers to go back for her. I guarantee that anyone playing the “name all the companions of The Doctor game” will probably forget one along the way and that one will probably be Dodo, although she travels with The Doctor for all of series 3 most details of Dodo’s life, her childhood, the reasons she started and stopped travelling with the Doctor, and even her death are shrouded in a confusion created by several highly contradictory and speculative accounts. 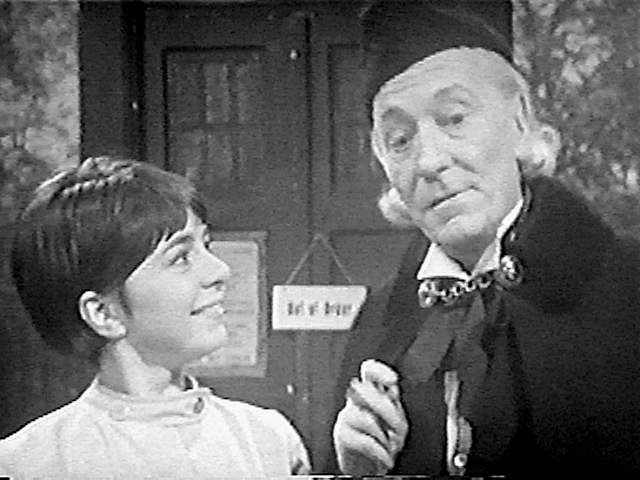 Her departure is extremely bizarre, in “The War Machines” after being brainwashed by WOTAN The Doctor sends Dodo away to recuperate in the country, however she never returns, sending her key to the TARDIS back with Polly, no explanation, no goodbyes, very strange indeed. There isn’t really a lot to say about Adam, the forgotten companion of the new series (I think its telling that Adam is just about the only character that doesn’t make a return appearance in “The Stolen Earth/Journey’s End”) however is exit is remarkable as he is the only companion that has ever been ‘fired’ by The Doctor for not being good enough and messing up. Lots of companions make mistakes or disobey The Doctor, indeed quite a few stories would never happen if it wasn’t for a companion wandering off somewhere or touching something they shouldn’t, I think The Doctor just plain didn’t like the guy. Poor, poor Kamelion, the unfortunate, malfunctioning, weak willed android disaster, seemingly realising he was just too rubbish to live, he asks The Doctor to put him out of his misery and kill him, which the Doctor does, if the Doctor effectively murdering one of his companions isn’t weird, then I don’t know what is. Oh goodness me, Adric. He dies heroically saving the Earth, crashing into the prehistoric planet, causing the extinction of the dinosaurs, the reason why I find this one a weird exit is The Doctor’s reluctance to save him from his fate, the TARDIS is damaged in “Earthshock” but he still chooses not to travel back in time and save him once its started working again. 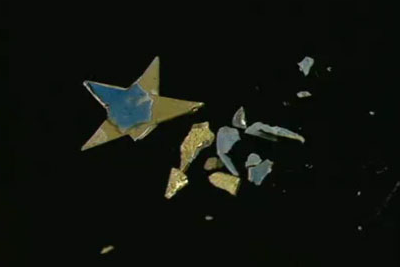 The introduction of the “fixed points in time” concept in recent series actually lends us a nifty piece of possible retcon, if Adric’s death is a fixed point in established history then it would cause a paradox if he saved Adric, however the Doctor doesn’t bring any of his up at the time so it really seems like he just can’t be bothered. Put yourself in Susan’s shoes, you go to an Earth devastated by a Dalek Invasion, you’re separated from your Grandfather and friends and meet a freedom fighter called David Campbell, you fall in love with him and your Grandfather, deciding from completely out of nowhere that you’re far too dependent on him, locks you out of your home and leaves you with a near total stranger in a destroyed, terribly dangerous city after making some half hearted promises that he’ll pop back and see you sometime. 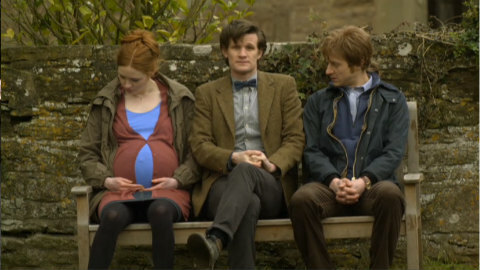 Couldn’t The Doctor have least dropped them off somewhere nice instead of leaving them in a post apocalyptic wasteland? Susan’s enforced exit is made all the weirder by the fact that The Doctor is stranding his own grandchild in a total hellhole with someone shes only just met! 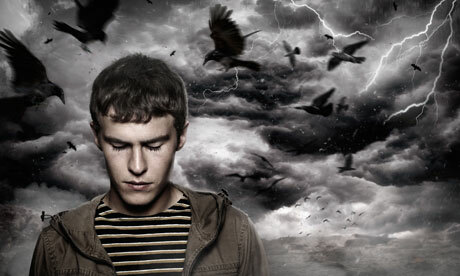 The Fades: I liked this interesting little show, its got its flaws for sure, at time it could be too juvenile, the pop culture references could sometimes feel forced and the drama seemed to move at too slow a pace, however these minor gripes aside its got bags of potential for another series. It was visually stunning, the mythology of the show was brilliantly set up and the characters were well thought out and sympathetic. Handled right this could easily be a success in the mold of “Being Human”, a move up to BBC 2 and few more pennies spent on the effects could move this show from ‘good’ to ‘great’. TV in the UK lacks a show that aims for out and out horror in the way that The Walking Dead does in the US and its important than even if The Fades doesn’t make a return that these sort of shows are made. The Walking Dead: The second series has just started here in the UK, running about a week behind the US, I had plenty of problems with the first season of the show (see my epic post ranting about it on this here humble blog) and they were almost enough to put me off watching the second season all together. Despite my reservations I’ve enjoyed the first three episodes far more than anything since that stunning pilot, things still grate on me a little though, the continual stupid decisions made by the group and the marginalization of characters like T-Dog and Glenn in favour of Rick and his family. 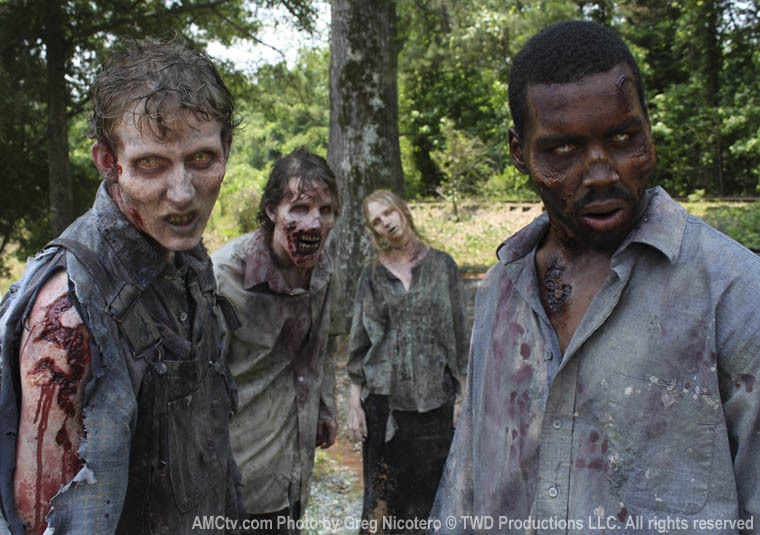 The cut in budget the show took from the network is beginning to become evident, with some of the zombies looking a bit cheap. I also wonder how they’re going to sustain the drama over 13 episodes with Carl’s predicament and Sophia’s disappearance already starting to feel dragged out, even though we’re only 4 episodes in. This being said they’re are still plenty of reasons to watch, primarily for me, what on Earth Shane will do next, his motivations are mysterious and he appears to be getting more and more unhinged as signified by him shaving his head in episode 3. I’m also pretty intrigued by Daryl, the softening of his character seems pretty deliberate and hes easily the most competent of the group. This mean hes probably doomed to die horribly. The show has already been renewed for a third season and I think the production team is going to be faced with some increasingly hard choices regarding just how much of the comics plot line they can put on TV. Supernatural: Just finished watching the sixth season (yes I know I’m terribly behind) and despite some of the negative buzz I actually enjoyed this season quite a lot, I think it suffered from having to continue an arc beyond its prescribed life span, the early episodes felt unfocused and inconsequential as if the show couldn’t quite decide whether to return to a more “monster of the week” format or start a new arc story. 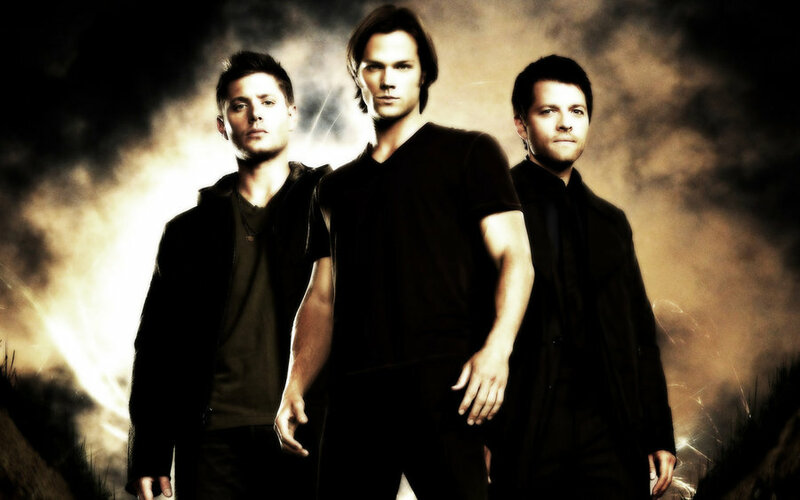 Once it found its feet those Winchester boys were as good as ever and the supporting cast were also excellent, Castiel being the stand out, I loved him in his showcase episode “The Man Who Would Be King”, I’m intrigued as to where season 7 is going to go with the arc, I’m starting to worry that they’re going to run out of Big Bads, having laid waste to daemonic entities of all nearly every type, the progenitor of all said monsters, Satan and most of the heavenly host! 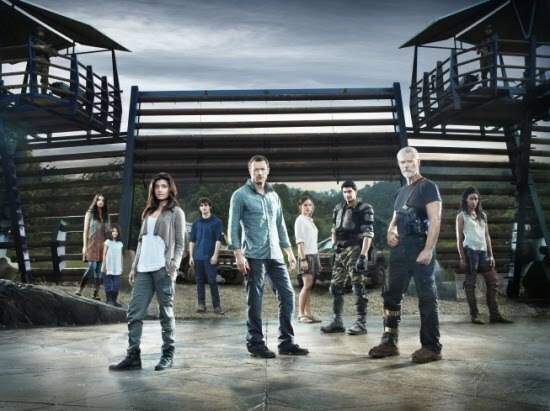 Terra Nova: just a quick note on this one, I’d love to know what they’re doing with that 4 million dollar an episode budget because they’re certainly not spending it on dinosaur effects, if they’re managing more than one dino and episode I’d be amazed and frankly the one they did have in the most recent installment looked flipping awful. I don’t understand why a show that sells itself on the basis of being about people trying to survive on a prehistoric parallel Earth chooses to concentrate on said people having arguments either in living rooms or a clearing in the jungle. As a very famous singer once said – a little less conversation, a little more action please. 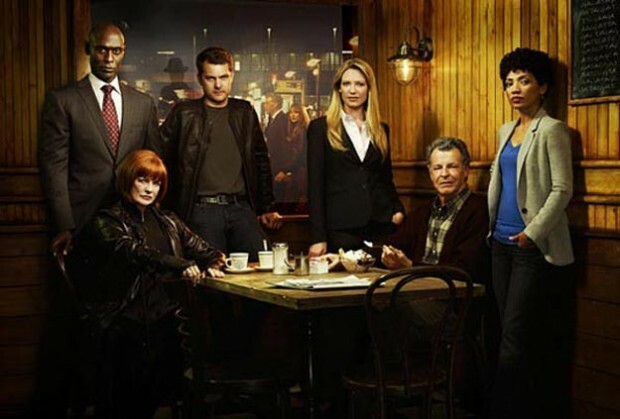 Fringe: Fringe seemed to be in an odd sort of holding pattern for its first 4 episodes of its fourth season, it almost seemed afraid to kick on with its story without Peter, returning once again to a season one “monster of the week” format. As such it was beginning to get frustrating, it seemed like they’re were a million questions left to be answered at the end of season 3 and the producers were actively cocking a snook at viewers by ignoring them all together. Thankfully with the reappearance of Peter the story has really got going, with more going down in episode 5 than in the previous four installments, however I really hope they’re going to make more of the fact that they’re in contact with the “Over There” team, this story line feels totally neglected and I want to know what the Walternate is up to! Buffy and Angel: Myself and my other half have embarked on a rewatch of the seminal Joss Whedon shows, watching them in broadcast order, I’m finding it a quite rewarding way to watch, especially as living in the UK means we often got shows months after their US transmission and sometimes edited bizarrely, or shown in the wrong order, thus rendering the intertwined story nonsensical. We’re in the fourth season of Buffy/first season of Angel and I must confess I’m enjoying Angel a great deal more, I hated Buffy season four on the first time around and now I know whats going to happen it seems interminable. Its thirteen episodes before we finally meet our Big Bad of the season, I found the whole concept of The Initiative fairly silly and the weakening of Buffy as a character (all that rubbish with Parker) was massively irritating, whereas with Angel I’m loving the beginning of their Myth Arc and the relationship between Angel, Cordy and Wesley. As a Doctor Who fan I’m finding the parallels between Buffy/Angel and Doctor Who/Torchwood really interesting, RTD cited Buffy and Angel as a major influence and doing this rewatch very much brings that home, especially comparing the tone of Angel to Buffy, it feels exactly like the Who/Torchwood relationship. Are you watching any of these shows? I’d love to hear what you think, leave your comments below! School Reunion could have easily fallen into the trap of “Very Special Episode” bringing back as it did the wonderful and sadly missed Elisabeth Sladen as Sarah Jane Smith, luckily for us the episode neatly side steps the schmaltz in favour of a good, strong story. 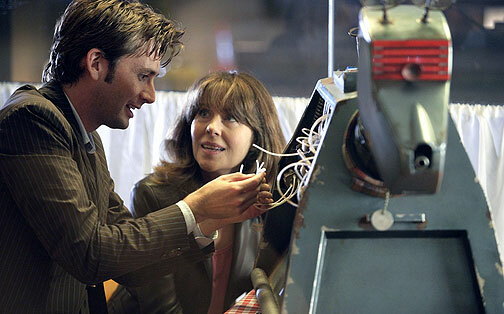 The acting talent is on good form, Anthony Head’s Mr. Finch making for a great baddie, Noel Clarke’s Mickey Smith making a solid return and upgrades Mickey from being mostly useless in the viewers mind and Lis Sladen moves back into Sarah Jane’s skin as if she’d never been off our screens, don’t forget that this success of this episode lead directly to the creation of The Sarah Jane Adventures. I’ve found that this is a story that benefits immensely from repeated viewing, on the first pass its a great, traditional Who story but on the rewatch the subtle themes of pain and loss that weave through the episode come to the foreground, making this installment stand out. My second favourite season opener since the shows return Partners in Crime is a wonderful romp from beginning to end, moving effortlessly from brilliantly funny to poignant. This episode also does a great job of redefining the character of Donna Noble in only 20 minutes, utterly erasing the screechy, annoying Donna we first met in “The Runaway Bride”. 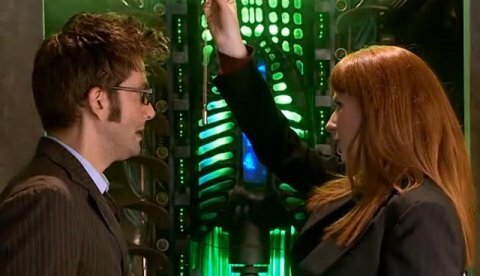 This episode makes a great use of Catherine Tate’s comedic talent, especially in the scene where the Doctor and Donna, separated by a room but able to see each other through a window mime their adventures so far at each other. I also love that the script keeps our two protagonists separated for most of the episode so when they finally bump into each other you feel like punching the air with delight. I love surreal, labyrinthine plots and this episode delivers that in spades, also I love the exploration of the relationships between The Doctor, Amy and Rory. If nothing else this is the episode that proves beyond doubt that Amy really does love Rory after 6 episodes of mixed signals. We also get a good long look at The Doctor’s always just below the surface dark side. I really hope we get another encounter with The Dream Lord who is wonderfully brought to life by Toby Jones. After their stunning debut the Weeping Angels needed an appropriately awesome return and The Time of Angels delivers in spades, it also gives us the return of the lovely River Song who makes the entrance to end all entrances. What I really enjoy about this story is that it takes an brilliant Who monster and actually makes them even more scary! It shows us the full, horrifying power of one of the most ruthless and unstoppable baddies the Doctor has every encountered with Amy’s predicament becoming genuinely disturbing, the part where she rubs her eye and a bunch of dust falls out makes me shudder every time. 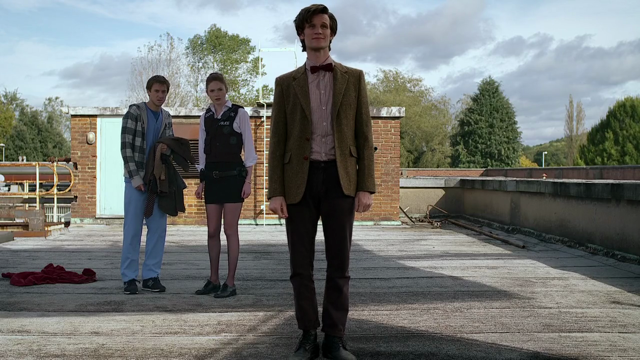 For me, this is the episode that got Steven Moffat the job as Doctor Who supremo, an amazing, melancholy love story with such a clever plot the episode actually suffers from being constrained to 45 minutes, this could have been a movie. 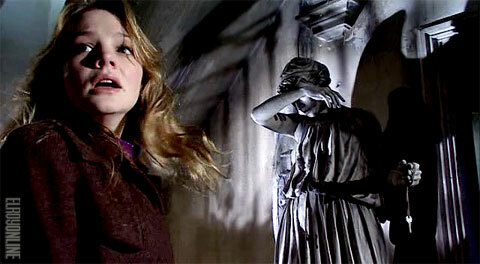 Sophia Myles is excellent as Madame de Pompadour and her chemistry with David Tennant is very apparent. Even though it constitutes a continuity error as Moffat hadn’t read the script for “School Reunion” I also like the less acrimonious relationship between Mickey and Rose as most episodes with them in made me wonder why they were ever a couple to begin with. The script really sings in this episode and I love the final reveal of the name of the space ship our heroes are on, as all the pieces fall neatly into place. If you look up “romp” in the dictionary I think you’ll find a screen shot from this episode, this one is just great fun from beginning to end and uses one of the great Who traditions of taking real events (the mystery of Agatha Christie’s 10 day disappearance) and revealing that the good Doctor had more than little involvement. 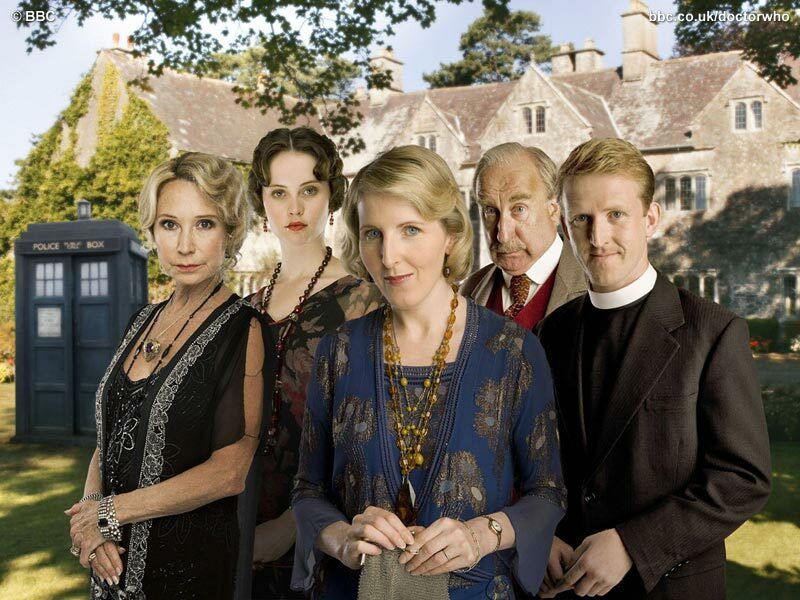 This one is not just funny, its also clever, putting in loads of references for Christie buffs and once you realise that our heroes are stuck in the middle of an Agatha Christie mystery thats happening for real its great fun to play along and see if you can figure it out before The Doctor. My favourite series opener, its a brilliant introduction to our new cast of characters and a rip-roaring adventure, I love that hurls you straight in the deep end as The Doctor tries to deal with a turbulent regeneration and the imminent destruction of the Earth. Matt Smith comes out of the blocks sprinting in his performance as The Doctor, wiping away all worries that he wouldn’t be able to fill the shoes of the previous TARDIS occupant. I really enjoyed Moffat doing something different with the companions as well fully exploiting the time travel element of the show in a way that no one else really has. Groundbreaking and awesome. The jewel in the crown of series 6, touching, funny, devastating and ultimately triumphant this is a truly beautiful story focusing on the real love story in Doctor Who, between The Doctor and the TARDIS. Plaudits must go to Suranne Jones, asked to personify a machine which exists in all time and space and is thousands of years old she pulls it off with aplomb. For us old hands though the sheer amount of call backs to the classic years, which all feel completely natural, is wonderful. Its also a story which has endless potential for expansion, I wonder if we’ve really seen the last of House and I really hope that one day we get to meet The Corsair, who sounds like a great foil for the Doctor. 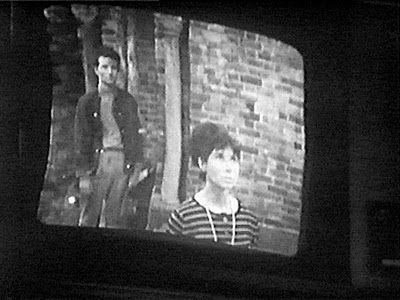 One of my very favourite types of story in any genre is Alternative History and this one of the best examples ever done in genre TV, on the face of it this episode is “Sliding Doors” done Who style but as the nightmare begins to unfold we realise that this is so much more and the profound effect that The Doctor has on the lives he touches. Catherine Tate’s second attempt at playing the “unenlightened” Donna is much more successful this time around and RTD’s writing of this alternate Donna is incredible. The dystopian Britain that we end up in is brilliantly realised and when the government starts the internment of foreign nationals it becomes utterly terrifying. I really enjoyed the reveal that the “time beetle” is part of the Trickster’s Horde in a lovely reference to The Sarah Jane Adventures and the Bad Wolf revelation is shocking and exciting, even years later. What can I say about this episode that hasn’t been said before? Incredible acting, great characters, touching and funny dialogue, a brilliantly clever idea and the single most terrifying monster ever conceived of in Doctor Who history, not only one of the greatest Doctor Who episodes ever made but one of the greatest examples of genre TV in the last 10 years. Simply amazing.